36 • April 2018 • S I G N & D I G I T A L G R A P H I C S DIGITAL PRINTING AND FINISHING DIGITAL GRAPHICS Focus on Focus Blur effects that control visual emphasis and make images really pop Stephen Romaniello is an artist and educa- tor teaching digital art at Pima Community College in Tucson, Arizona, for over 26 years. He is a certified instructor in Adobe Photoshop and the author of numerous books and articles on the creative use of digital graphics software. Steve is the founder of GlobalEye Systems, a company that offers training and consulting in digital graphics software and creative imaging. B Y S T E P H E N R O M A N I E L L O The Digital Eye dominant by blurring surrounding areas that compete for the viewer's attention. Blur Gallery Filters in Photoshop's Blur Gallery create this effect using controls that simulate traditional camera settings. There are several choices including Field, Iris, Tilt/Shift, Path and Spin blurs and these filters can be used in several ways. This article will show you a few techniques that control depth of field to target focus on specific elements. Because you'll be using a single filter, I suggest that the back- ground layer be duplicated and then converted to a smart object. This way you'll be working in a non-linear workflow and you'll be able to tweak the adjustments at any time during the process. To begin, open an image. 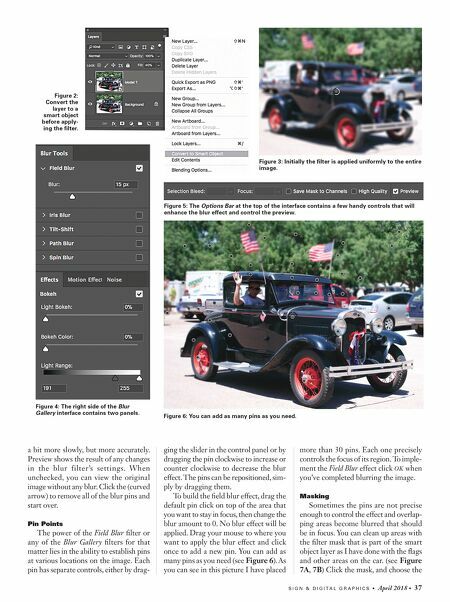 The image I've chosen contains a lot of visual noise—like the cars in the background—that competes with the main subject (see Figure 1). The plan is to blur the noisy areas and maintain the natural focus on the vehicle. By the way, if you want to try this using this image, Go to: https://drive.google.com/file/d/14Osxqc9vM49v886CU- zpyTE-Hzb9VpAG/view?usp=sharing where you can download the image. In the Layers panel click the Background layer to target it. From the Layer Options menu choose Duplicate Layer. Make any tonal adjustments that you deem necessary. You can use Levels, Curves, Hue Saturation or any other adjustment you that will improve the overall tonality. It's advisable to use adjustment layers for this purpose. From the Layer Options menu the choose Convert to Smart Object (see Figure 2). Field Blur The Field Blur option is the perfect place to start on an image like this one. Go to Filter > Filter Gallery > Field Blur. Initially the filter is applied uniformly to the entire image (see Figure 3). The circular pin icon in the middle of the screen is the blur control. The right side of the Blur Gallery interface contains two panels: The Blur Tools panel at the top with the Field Blur con- trols and options, and the Blur Effects panel at the bottom with some extra options for the Bokeh effect as shown in Figure 4 (more on Bokeh in a bit). The Options Bar at the top of the interface contain a few handy controls too that will enhance the blur effect (see Figure 5). If the High Quality box is checked, the preview is rendered T he image may be perfect in most respects. The contrast is fine, the color works, the composition is well balanced and the content has potential. The problem is that it's short on drama. Controlling what is sharp and what is blurred can make a picture really pop. 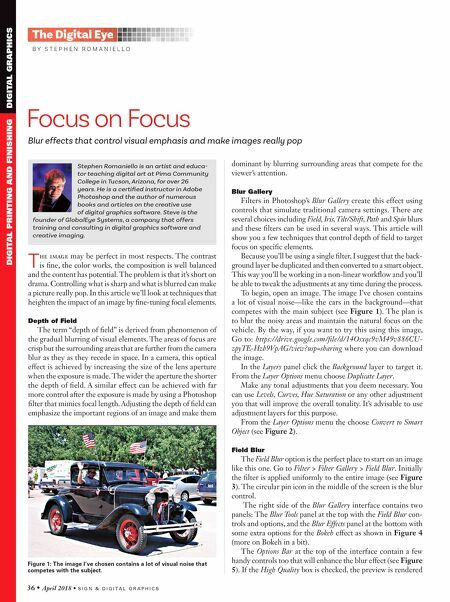 In this article we'll look at techniques that heighten the impact of an image by fine-tuning focal elements. Depth of Field The term "depth of field" is derived from phenomenon of the gradual blurring of visual elements. The areas of focus are crisp but the surrounding areas that are further from the camera blur as they as they recede in space. In a camera, this optical effect is achieved by increasing the size of the lens aperture when the exposure is made. The wider the aperture the shorter the depth of field. A similar effect can be achieved with far more control after the exposure is made by using a Photoshop filter that mimics focal length. Adjusting the depth of field can emphasize the important regions of an image and make them Figure 1: The image I've chosen contains a lot of visual noise that competes with the subject.